Get ready for an Amazon adventure when you play Amazon Wild Slots – one of the hottest UK slot games around. It's a guaranteed good time with loads of chances to win. Good luck! 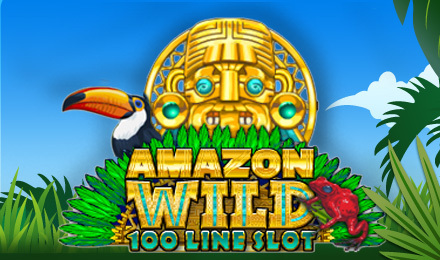 Take a trip to the Amazon and spin to win Amazon Wild Slots! It has a wild animal theme, it's packed with adventure, and there are a whopping 100 paylines, guaranteeing loads of chances to win! The Aztec is your Wild, and can substitute for any other symbol except the Scatters to complete a winning line. 2 Aztecs on one reel will cause the reels to expand, giving you bigger chances for bigger wins. The Amazon Map Bonus is the Scatter and 3 or more will trigger the Amazon Treasure Bonus. It has a Pick Me game where you can win extra bonus cash.